Oh yum! Perfect as a treat with a cup of tea! Preheat the oven to 160°C/325°F/gas mark 3. Line a 12-cup muffin tin with paper cupcake cases. Place the dates and water in a large saucepan and bring to the boil. Add the bread soda and simmer for 3 to 5 minutes. Remove from the heat and allow to cool. Using a hand blender or food processor, blitz until it’s a coarse, sticky consistency. Beat together the sugar and butter in a large bowl until light and fluffy. Add the eggs and sieve in the flour, baking powder and xanthan gum and continue to mix until smooth. Pour in the milk and add the mixed spice and vanilla. Add in the cooled date purée and combine well. Pour the batter into the lined muffin tin. Bake in the preheated oven for 20 minutes. Meanwhile, to make the toffee sauce, melt the butter in a large saucepan over a medium-low heat, then add the brown sugar. Let this come to the boil, then cook for 2 to 3 minutes, until the sugar has an intense caramel colour and flavour, but be careful not to burn the caramel! Pour in the cream and whisk continuously. The mixture will clog a little, but don’t panic. Let it come to a boil again, then reduce to a gentle simmer. Cook for 2 to 4 minutes, until it coats the back of a spoon. 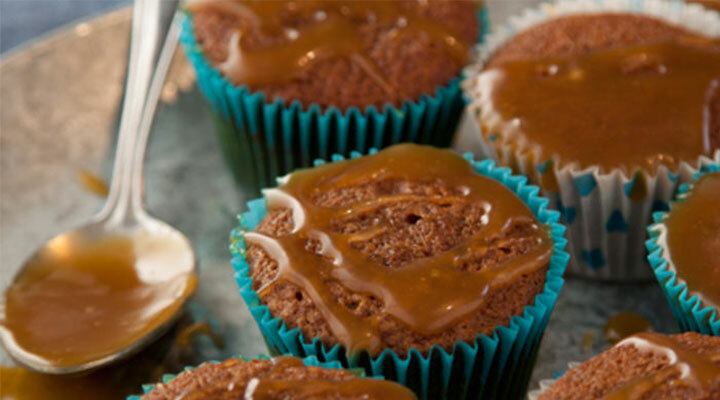 To serve, drizzle the sticky toffee cupcakes with the sauce when they come out of the oven. Top Tip: Toffee sauce is a stronger butterscotch sauce, so if you prefer a milder flavour, cook the caramel until the butter and sugar are just combined.